Women buy 68% of new cars in the U.S. and 65% of new tires? Roughly fifty years after the parasols fiasco, another car manufacturer, recognizing that women now buy 65% of all new cars, tried to reach out to women. Cadillac Catera launched new advertising on the 1996 Super Bowl broadcast featuring Cindy Crawford in a leather get-up reminiscent of Xena, and copy that began, "Once upon a time, there was a princess...” Astonishingly, architects of the campaign asserted it was designed to appeal to women via its "fantasy empowerment" theme. Once again, it didn’t work. In her second year as a manufacturing engineer at General Motors Corp. in the early 1980s, Mary Sipes had to get a toolmaker to change some of his equipment. He replied that he was not going to take orders "from some little girl." Today Sipes is in charge of all full-size sport-utility vehicles for GM. She is one of a new generation of female executives making their mark in the auto industry, slowly changing a male-dominated culture just as the marketplace is shifting around them. Women represent about half of all licensed U.S. drivers, up from 44 percent in 1972, and they account for a significant and climbing percentage of new-vehicle sales. Automakers are catching on, nowhere more intently than at GM and Ford Motor Co., as Detroit's two wounded giants try to reconnect with alienated U.S. car buyers. Women now run three major brands - Saturn and Hummer at GM, and the Volvo North America subsidiary of Ford - and are increasingly present in such male-dominated areas as vehicle engineering, design and manufacturing. As a result, the products on American roadways are beginning to change. Female auto engineers say they are trying to expand the appeal of each vehicle, making them suit women and giving men more than they expected at the same time. "We don't do pink trucks," said Sipes, who as vehicle line director oversees development of GM's full-size SUVs and has women working as an assistant chief engineer and in finance, marketing and program management. "But we now realize these trucks are being purchased by women as well as men. And if you don't have women involved on a daily basis ... in that product design, you're going to alienate those women who would love to buy it otherwise." GM Chairman Rick Wagoner says he is counting on Sipes' new line of trucks to help restore the company's profitability. The designs will include greater visibility, instrument panels that sit lower and farther forward to put more distance between occupants and air bags, adjustable pedals for drivers of different sizes and lightweight materials so that seats and doors can be moved more easily by people with less upper-body strength - all elements that were added by women with women in mind, Sipes said. Such changes are cropping up throughout the marketplace. An entirely new category of vehicle - the crossover, or car-like SUV - has evolved largely from women's desire for a vehicle that is sportier than a minivan but handles better than a truck. The introduction of such features as run-flat tires and the wider marketing of safety technology all trace back to efforts to reach female drivers, said Maureen Sullivan Martin, an industry consultant and spokeswoman for the Automotive Women's Alliance. "I think everyone would agree we have a long way to go, but the manufacturers and suppliers are embracing" an emphasis on women, Martin said. "It may be slow, but it certainly has a high return on investment." It also strikes some analysts as a last-minute push to overcome years of neglect during which Detroit has valued women mainly as props to promote new car designs. Automakers have been among the slowest of U.S. businesses to appreciate the value of women as decision makers, according to the New York-based consulting group Catalyst. In a recent Catalyst survey of major corporations, just over 11 percent of top executives in auto-related companies were women, compared with more than 22 percent in publishing, nearly 16 percent in pharmaceuticals, 14 percent in railroads and 15 percent in mail and freight delivery. Advertising for cars and trucks is still heavily male oriented, dominated by images of wild speed, trucks pounding up mountains and lots of mine-is-better-than-yours, said Marti Barletta, a specialist in marketing to women who has consulted with major auto companies. "There is very little indication of any attempt to understand what types of communications women respond to," Barletta said. "I just find myself astonished that the largest consumer industry in the world doesn't know who its primary buyers are." Society has changed in the past 30 years, and women have far more buying power than ever, she said. 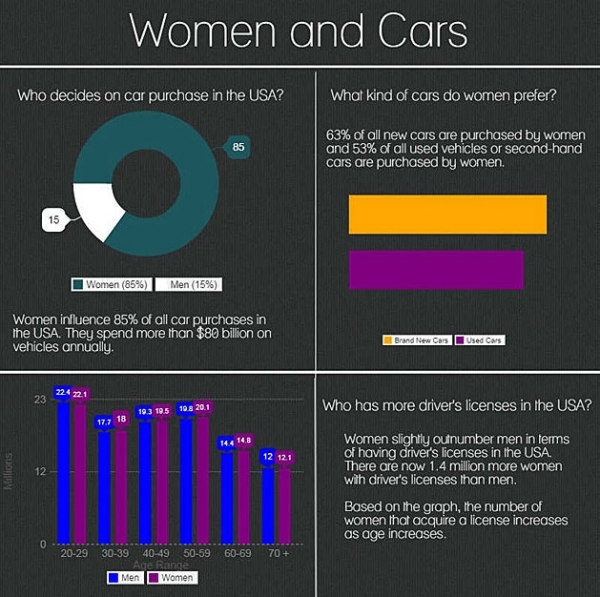 Although studies have long suggested that women influence almost all car-buying decisions, statistics show that women are making more and more of those purchases themselves. "What has really changed in the industry is the consumer. The 'he' is now a 'she,' " said Donna Kane, who recently retired as a longtime marketing director for Hyundai in North America. Although such Asian companies as Hyundai come from male-dominated business cultures, they have done better than their Detroit rivals at appealing to female customers in the United States, statistics show. So far this year, women accounted for 36 percent of all new car and truck purchases, according to the Power Information Network, although some in the auto industry say the figure is closer to 45 percent. In certain segments, especially compact cars and midsize cars, women make up nearly half of all buyers. Women also account for at least half of all sales at Volvo, Honda and Toyota, and for about half of all sales of the newly redesigned Ford Mustang. Some progress has been made: Seven women are among the 52 top corporate officers at Ford - that's up from one in 1996 - and the company leads the U.S. auto industry. Similarly, Ford employs about 2,100 women with engineering degrees, compared with nearly 11,100 male engineers. The number of female engineers has more than doubled since 1990, and the number of men has increased about 21 percent. "It has improved significantly from five to 10 years ago, but we really still are just beginning to tap (women's) business knowledge," said Felicia Fields, Ford's vice president of human resources, adding that too many women at Ford are in staff positions instead of having responsibility for profit and loss. But the old, male-dominated car culture will not die easily. Karen Rafferty, who directs Cadillac Motorsports and oversees marketing for the V-series performance Cadillacs, found that out a few weeks ago when she entered an amateur racing tournament and was blocked from competing directly against men. She proceeded to post a faster time than all but three men out of a field of 110. "That made people stop and look," Rafferty said. "You just have to prove your salt anywhere you go.